Take an interstellar journey to a faraway land, where the sea of stars never ends and exciting cash payouts are plentiful. Click here to play! The classic slots are back in fashion, and this is one of the best! 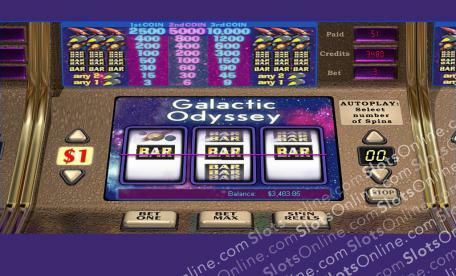 Galactic Odyssey is a mind-bending 3-reel slot played across a single pay line, where there is no need to pay for extra lines. All winning combos are wins on the pay line! There are no bothersome Wilds, Scatters, or Bonuses to distract you from earning a stack of cash. The Bars and Planets will pay out relatively well, but if you are seeking the biggest jackpots, then try your hand at spinning up The Rockets. Landing three Rockets on the pay line will earn you up to 10,000 times your original bet! There are several play options, with up to three coins able to be played on each spin, so start your adventure on the Galactic Odyssey today!